The Neotropics, particularly southern Mexico, harbors the greatest diversity of oak species in the New World. These oaks are often among the tallest trees in the forest areas in which they occur, ranging from low-elevation to high montane forests. 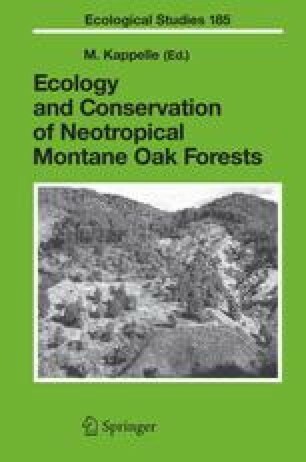 The clearest relationships of Central American oaks are with lower-elevation Mexican oaks. Several species are widespread from Mexico to Costa Rica and Panama. In addition, at least one distinctive clade of red oaks with annual maturation is common in Central America and Colombia, and includes members of the Q. seemannii complex (including Q. rapurahuensis and Q. gulielmi-treleasei), Q. costaricensis and Q. eugeniifolia, and, in Colombia, Q. humboldtii.